That’s why we introduced a winter guarantee for all driver-partners in Johannesburg. 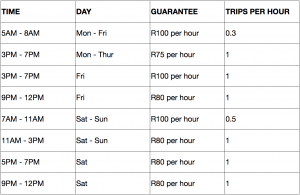 On Saturday morning, for UberX drivers, there is an earnings guarantee of R400 — after the Uber service fee — for the morning hours of 7am to 11am. Let’s say that, during this time, Thabo completes 3 trips and his fare earnings come to R300 after the Uber service fee. Well, that is less than the guaranteed amount of R400. So Uber will add an additional R100 so that Thabo’s fare earnings for that time period come to R400.